Orlando Villa Magic is a beautiful executive villa in Orlando with upgraded furniture, it is located on the impressive gated community of Highgate Park; 10 minutes to Disney, our luxury fully air-conditioned vacation villa has 5 bedroom 4.5 bathroom and over 2,450 sq ft of living space. 2 Twin bedrooms sharing a bathroom. Particular attention has been made to the extended heatable SOUTH FACING 30 x 15ft pool, overlooking fields of Orange tress, raised Jacuzzi, covered lanai, with ceiling fan to shade from the sun with extended decking for those relaxing moments of your vacation. For the kids there are plenty of pool toys to keep them occupied and also a very convenient poolside toilet and shower. Upgraded sun loungers/chairs and tables are also provided. Orlando Villa Magic is ideal for two families and sleeps 12 in comfort (one double sofa bed). 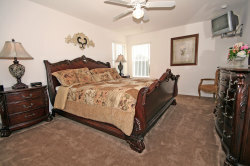 Our vacation home is within easy reach of all major themed parks, restaurants, shops are nearby. 192 is a very short drive away, where there are lots more restaurants/shops. Our villa is within 2 minutes drive from Publics supermarket, Chinese and pizza takeaways and within 5 minutes of a 24-hour Wal-Mart. Double entry doors lead into the foyer; on the right is the formal lounge, with leather double sofa bed and dining room. At the end of the hall is the down stairs cloak room and beyond is the open planned kitchen, breakfast room and family room. The breakfast room has seating for 4 around the large table overlooking the pool and deck. The kitchen is fully equipped with cooker, large fridge/freezer with icemaker, dishwasher, and microwave. The large family room with its double heighted ceiling, which overlooks from the sky bridge, has 2 leather sofas, matching side tables and coffee table, 42 inch plasma HD cable TV, DVD player with DIVx. HiFi CD stereo, Playstation 2 with games. 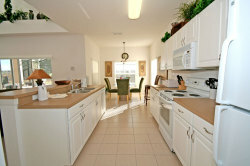 Within a self-contained unit within the garage you will find the full size washing machine and dryer. Ironing board and iron are also supplied. The beautiful master bedroom, with upgraded furniture takes up the whole of the left hand side of first floor of the property with its King size bed, dresser and mirror, bedside tables, wall mounted cable tv, radio alarm clock and hairdyer. Leading from the bedroom through the archway is the very large master bathroom with double walk in shower, bath, separate wc, his & her vanity units and walk in closet. On the ground floor are the 2 Queen en-suites with cable TV, closets, dresser with mirrors, bedside table, radio alarm clocks. The en-suites have a bath with overhead shower, vanity unit, & toilet, towels are provided. 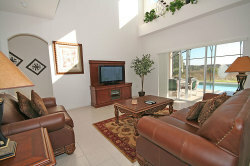 One of the suites leads onto the pool deck through the patio doors, this one also has a DVD/video player. Upstairs there are 2 Twin bedrooms which share a bathroom, bathroom has vanity unit, toilet, bath with overhead shower, towels. The bedrooms both have dressers, fitted wardrobes, cable tv. One of the main features of the villa is the great SOUTH facing heatable pool 30 x 15ft with raised Jacuzzi and oversized pool deck. The area is not overlooked and the extended decking area has sun loungers, plus table and chairs for when you decide to eat lunch out by the pool. For the kids there are plenty of pool toys to keep them happy, also provided is an poolside shower and toilet (no more traipsing through the house to get to the toilet!) There is also a covered Lanai, with electric fan for those who wish some shade from the sun. For safety there is a removable fence around the pool. Highgate Park is a prestigious gated community, which has a childs playground and tennis courts. It is located on the Highway 27 and just minutes from 192, the nearest golf course is Championship Gates in 5 minutes. A short distance is Walmart and Publix, along with many restaurants and shops nearby.